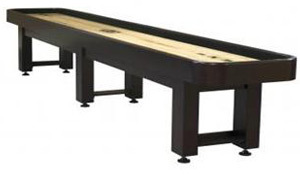 We now carry shuffleboards from three suppliers! Select a supplier below to view shuffleboard table line-ups. Not only does the Olhausen brand guarantee you a quality product, but you can also coordinate a themed games room with matching Billiard Table and Shuffleboard! Conceptualized and designed in Canada, Cool Curling game tables and accessories are proudly produced by skilled craftsmen in a quality-controlled environment. Canada Billiard is the largest manufacturing unit and distributor of billiard tables and accessories in Canada. All their wood is bought in Canada from Canadian distributors. Check out episode three of the Hamilton Tiger-Cats’ Game On! feature, presented by The Pool Shoppe! Watch OL Revenberg and Mike Filer play shuffleboard in the video below.